For some this is just something that is hot and black, for others like me it´s a must to survive. I can go out and the woods without most things but without coffee it´s just not the same. Most important is the morning coffee, I am not human until that first cup is emptied. But making coffee in the woods is not something you do by boiling up water and adding some powder and think that is coffee you are getting. 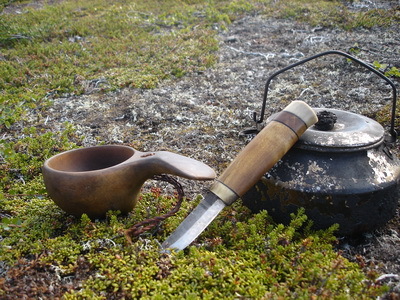 I make my coffee the old traditional way coffee made to be boiled (kok kaffe) and with a coffee pot (kaffepanna). The coffee I store in a reindeer leather bag with a plastic bag inside or sometimes I bring a birch box that works well as well. There is as many ways of making coffee in the woods as there is coffee drinking woodsman. I prefer to fill the kettle with water to about ¾, and then I put in enough coffee so it reaches the tops of the kettle. Then it´s time to put it over the fire and let it slowly boil up. After it boils I out aside and let it rest for few minutes before letting it boil up again. Now some people wants it to a boil a third time, others add cold water, some pour one cup of the coffee back in the kettle. Personally I just let it rest until the grounds have sunken to the ground. Another way is to put a burning fatwood stick (töresticka) in to the kettle, this gives slightly different taste to the coffee. Detta inlägg postades i Rekommenderas, Ute och omkring den februari 11, 2011 av Johan, Nordic Bushcraft. Coffee is an essential ingredient to a good outing over here as well. It sounds like you make it hot, black and strong – the only way to drink it.